Riding and dating with a biker girl for motorcycle picnic or camp. One of the great things about men or women riding a motorcycle is the freedom that it provides you. It can also teach you to be more inventive and more creative especially when it comes to planning a nice outdoor excursion. 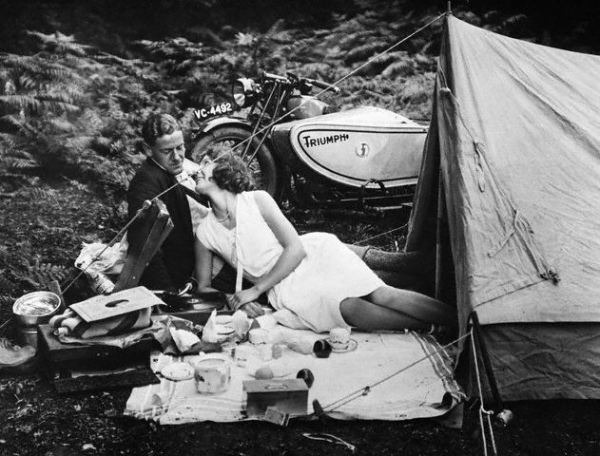 Think about the last time you and your biker match went on a picnic. What did you bring? Obviously you brought food to cook, probably a blanket, something to drink, perhaps even some charcoal for the grill, and a few toys and activities to keep things fun while the food was being prepared. If you used a car, chances are you filled a good portion of the back seat. Sure, it was fun, and everyone had a good time, but somehow you missed riding on your bike. Perhaps you even felt awkward in the car. But it couldn’t be helped, right? There is no way that you could carry everything you needed for a picnic on the back of a bike, right? Well, the truth is nearly everything you need for a picnic can be carried on the motorcycle back of yours and biker friend, either in the saddle bags or a well packed backpack. While it may be impossible to bring your favorite small grill to the campsite, the rest of the materials a picnic blanket, food, drinks, even a flying disc or a deck of cards can easily fit into your motorcycle storage areas or backpack with a little bit of ingenuity. Today there are backpacks that are specifically designed for carrying all the things you need for a romantic motorcycle picnic, including a blanket, a bottle of wine, a few glasses, and even a small lunch for two. In addition, many food retailers and manufacturers realize that having compact food packages is more useful for those on the go, especially if they have the relatively limited space of motorcycle saddlebags. So why not take the time to have a picnic? Take a look at the weather and pick a day where the weather is cool and comfortable, and perhaps a little bit sunny. Then look at the map and choose a place to have a motorcycle picnic with your biker lover. Remember, it doesn’t have to be a designated park or natural area. It could be a small green space in the city you live in, or perhaps the shore at the local beach. Another choice if you live in the city is the top of a building. Granted, you’ll have to leave your motorcycle down at street level, but the views will most likely make up for leaving your motorcycle behind. This entry was posted in Biker Dating, Ride out, Uncategorized and tagged dating a biker, motorcycle camping, motorcycle picnic on by .